This dramatic cleft cut in the High Atlas mountains is a beautiful Ourika valley (45 minutes by car). The valley sides tower precipitously above the mass of emerald green fields on the valley floor. In summer, when Marrakech swelters in the sun, this small Ourika valley is full of escaping Marrakshis, camping and picnicking and having a whale of a time. 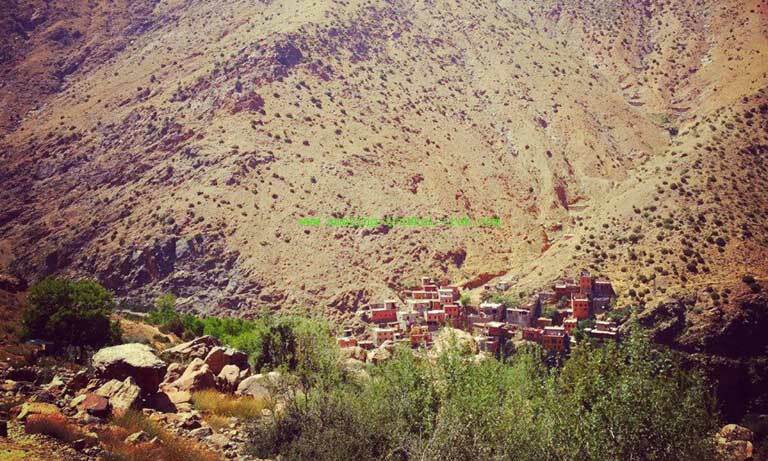 The Ourika valley, lying east of Jebel Toubkal is also popular with skiers and trekkers. The primary destinations are the ski resort of Oukaimeden or the village of Setti Fadma further east. In winter the valley is susceptible to flash floods which can cause tremendous damage. The worst of these in August 1995 resulted in the loss of hundreds of lives. This village is the site of an important four-day Moussen in August when a fair and market are set up at the Koubba of Setti Fadma is an amalgam of the villages of Asagour and Ilkhrie. There is good walking locally, with seven waterfalls hidden in a side valley across the river, and it is a good starting point for further afield.